The Lord spoke to me about the year 2015. The Bible says that for every purpose under the sun there are seasons and times. God has appointed different years for particular things. [Deuteronomy 2: 1-7] says; Then we turned, and took our journey into the wilderness by the way of the Red sea, as the Lord spake unto me: and we compassed mount Seir many days. And the Lord spake unto me, saying, Ye have compassed this mountain long enough: turn you northward. And command thou the people, saying, Ye are to pass through the coast of your brethren the children of Esau, which dwell in Seir; and they shall be afraid of you: take ye good heed unto yourselves therefore: Meddle not with them; for I will not give you of their land, no, not so much as a foot breadth; because I have given mount Seir unto Esau for a possession. Ye shall buy meat of them for money, that ye may eat; and ye shall also buy water of them for money, that ye may drink. For the Lord thy God hath blessed thee in all the works of thy hand: he knoweth thy walking through this great wilderness: these forty years the Lord thy God hath been with thee; thou hast lacked nothing. Moses got the Israelites out of Egypt and they crossed the Red Sea into the wilderness. However, they failed to go through the way of the Philistines because God knew that they were too weak to believe. They had too much fear to take the shortcut and so God took them through the longer route. But here is the amazing thing. When you read Deuteronomy Chapter 2, you might think that they spent afew days around the mountain of Seir. But when you read the scriptures, you will be surprised to find that of the forty years that they spent in the wilderness, thirty eight years were spent around Mount Seir. Thirty eight years! They were in one place. God got tired of seeing them there before they got tired of seeing themselves there. The scripture further says that Meddle not with them; for I will not give you of their land, no, not so much as a foot breadth; because I have given mount Seir unto Esau for a possession. Seir the mountain, was a possession of the children of Esau. It was for the Edomites. Thus while they moved for thirty eight years around the place called Seir, even though they were out of Egypt, they were still not in their own land. You can only marvel at a situation that God gets tired of yet you still can handle it. I realized then that a man can ask for the grace to stand in circumstances that are not his portion. Remember the apostle Paul? When he had a messenger sent from hell to torment him, the Lord told him that his grace was sufficient for him [2 Corinthians 12:9]. In 2015, God is not saying that his grace is sufficient for you. In 2015, he is saying that whether you want it or not, you have been here, on Mount Seir, for long enough. Because of what we believe and how we understand the things of God, I feel that there is a transition in the Church of Christ. There are things that are changing. However, these things seek to establish a Christian in a particular place if you indeed believe the true God. If you believed the true God, there are certain things that you ought not to be begging for. A Year of New Direction. The Lord told me that 2015 is going to be a year of radical change for his people. Not just change, but radical change. 2015 is going to be a radical year. He repeated and told me that it is going to be a year of new direction, not as of those that are beginning a new journey but of those that have been on a journey and they had to change course and take another direction. I am not talking of a situation where someone has been static. 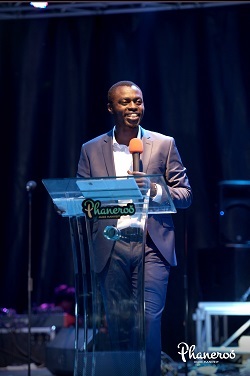 I am talking of a situation where someone has been on the move but God wants to switch certain things for him to go to another place because it does not matter where you move, the land where you presently are is not yours, it is for the Edomites and you have your own. You were comfortable in another man’s car. You were comfortable in another man’s house. You were comfortable in another man’s ministry. You were comfortable in another man’s business. It is about time that you got your own business. It is about time that you got your own ministry. It is about time that you got your own house. It is about time that you drove your own car. It is about time you got your own man! That is 2015. I do not care how many people you work with, you are different. I do not care how long you have worked at that work place. Whether you want it or not, you are going to leave that office for a better office. I do not care whether you have a job, or you don’t have a job, if you want money to build what you want to build, whether you want it or you do not want it, my God is going to make a way where there seems to be no way. Why? You have been there too long! Even if you have the grace to stay, God has run out of the grace and patience to sustain you there. God is tired! For 2015, thus says the Lord, whether you want it or not, this year, you are moving; whether you feel it or don’t feel it, this year you are moving; whether you have connections or do not have connections, this year you are moving; whether they love you or do not love you, this year you are moving; whether they help you or do not help you, this year you are moving; whether they want it or do not want it, this year you are increasing; whether they pay you less or pay you more, this year you are moving. Distinctively by the spirit, and this I tell you as the truth before God, I see that the Lord is aligning certain people at the forefront of many crafts, institutions and opportunities because there is a need for the advancement of the kingdom according to the gospel which is of Christ. Many things have been in the wrong hands for so long. This year, God is tired. This is not you tired, it is God that is tired. He told them that they had been on that mountain for too long. Move! Move! Move! Something must change. Your situation must change. Your circumstance must change. The place that you are in must change. God is tired! Your business is changing. Your understanding is changing. Your vision is changing. Your body is changing. Amen!! Thanks for the word. I receive with thanks.